Let's run through a round of the recruiting battle gameplay, and I'll be referring occasionally to the absolutely horrific-looking image I mocked up in yesterday's post. When the screen first loads, you'll see the current recruiting "score" for both teams, because the recruit comes in with a pre-existing interest level. So you're never going to start a battle round even, which will create a range of situations that will call for different tactics. You will also see one of the recruit's "faces" highlighted. 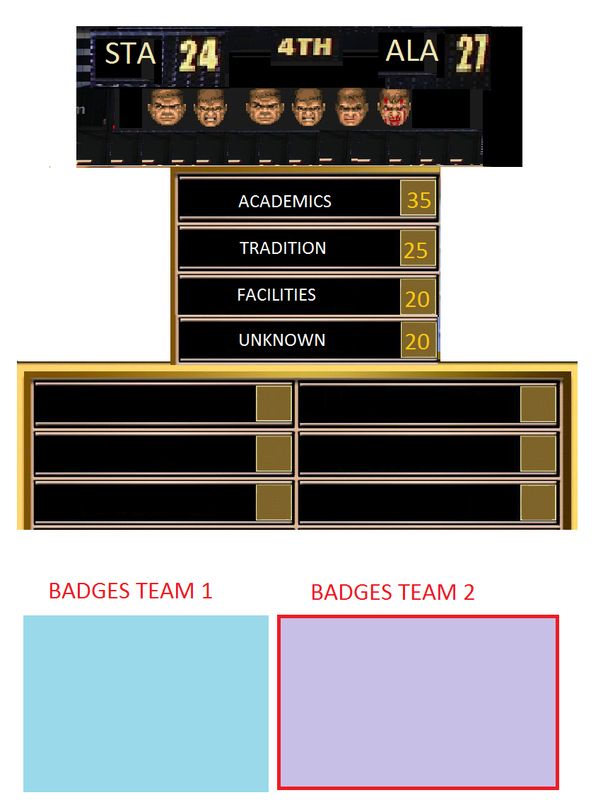 Which face is highlighted will change, depending on how close one team is to winning early, and after each round of badges/cards, if the highlighted face changes, there will be a pinball machine sound (you know which one--I don't quite know what to call it). Winning early is a good thing, because it helps you preserve resources if you're in a four or eight-team bracket, because badges/cards don't replenish between rounds. Once you move on to the next recruit, the deck is made whole again, but if you have two or three battles over a single recruit because of how many schools are interested in him, you have to manage your resources carefully. So, to sum up, you want to win by using as few badges/cards as possible. A close win may well be more valuable than an easy win, if it allows you to conserve your resources for a later round. Your "badge deck" is a profile of your school and it's existing quality in a fairly wide range of areas: academics, facilities, tradition, coaches, proximity (to the current recruit), etc. Both you and the CPU have decks to play. I think I can get very granular in terms of having this be as accurate as possible, and also have the individual school ratings be editable by the user. Stanford: 5 Academic, 3 tradition, 4 facilities. Alabama: 3 Academic, 5 tradition, 5 facilities. Stanford leads and plays 3 Academic badges (because it's their strength--you could play any badge you wanted). Alabama doesn't know how many badges Stanford played, and they decide to play 2 Academic badges. Both schools tried to conserve one Academic badge for a later round. Each badge is of equal value (you get more if your program is stronger in that area). So Stanford wins this round 3-2. If you look at the number besides "Academics" on the scoreboard, it says 35. That's how valuable Academics are for this recruit. Stanford gets those 35 points, plus a +5 bonus for winning the round, for a total of 40. Stanford's new point total is 64. Alabama played 2 badges, and since Stanford played 3, Alabama gets 2/3 of the Academic points, or 24. They miss out on the 5-point bonus. Alabama's new score is 51. I thought about making a winner-take-all for the points in each category, but that really reduces the depth of the strategy. A proportional points system makes for more difficult decisions. A note: the category that was just played (Academics) is now greyed out an unavailable for the rest of the battle. Okay, let's move on to Round 2, and Alabama leads off. Alabama plays 4 Tradition cards, and Stanford plays all 3 of theirs. Alabama wins the round and gets 25 points, plus the 5-point bonus for winning the round. Stanford gets 3/4 of the category points, or 18, and no round bonus. These battles can be anywhere from 1-3 rounds (depending on the quality of the recruit), but since this is two major programs, let's assume this is a 5-star guy, which would make it a three-round battle. Stanford is in an interesting situation, because their facilities are not as good as Alabama's. Do they just throw down all their facilities cards (4 of them), and hope that Alabama doesn't play all 5? Alabama is probably playing all 5, though. Almost certainly. What can Stanford do? Well, here's the exception I mentioned earlier. Instead of playing Facilities badge cards, they could try to guess the Unknown category. If they're successful, they immediately win the round and get the category points and the +5 bonus. Why would you do that? Well, this situation is one example. There might also be a situation where your opponent has 5 badges of a particular type and you have only one. Instead of getting 1/5 of the category points, it might be worth taking a flyer, because if you guess correctly, you win the category. Recruits will have clusters of interests, so the unknown category won't be purely random, but there will be enough different types of badges that it won't be easy, either. So Stanford guesses--um, let's say they try proximity, because the recruit is from California--but that's incorrect, and Alabama wins both the round and this recruiting battle. Like I said, low-level recruits are just a one-round battle, because only two teams are interested. With eight teams interested in a five-star recruit, though, you have to survive three rounds of battles to get the player to sign. I'm hoping that will be a good way to build tension, plus you have to manage your resources carefully (the CPU on the other side of the bracket is losing cards in each round as well, because the AI is actually going to "play" those rounds against each other). Well, that went pretty long. Thanks for hanging in there and letting me sort through all this. Like I said, please send suggestions if you have them. This isn't a final take or anything, but I think it's a solid place to start.